I am so elated over the outcome of this super fun, kickoff to summer-time recipe. It was one of those things I dreamt up (and loosely wrote up) while sitting at my computer working and when it finally came time to make it, I crossed my fingers and dove right in. I had to make a few subtle corrections from my original notes to make the tart shells work perfectly, but other than that, it all came together so perfectly. On the first batch, I didn’t use the paper muffin cup liners and the tart shells didn’t want to come out in one piece, even with greasing the pan, but add in the paper liners, and it was simple as can be! This recipe is insanely simple to make, please don’t let the three-part recipe throw you off. Just remember to refrigerate your coconut milk the night before for the whipped “cream”. The dough for the tart shells takes just minutes to make, you need only one bowl and you can literally just use your hands to mix it, that’s what I do. 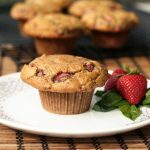 It takes just a couple of minutes to get it evenly divided and pressed into the muffin cup and while the mini tart shells bake, you can cut up the strawberries and allow them to sit for a small bit in the balsamic/maple sugar mixture. 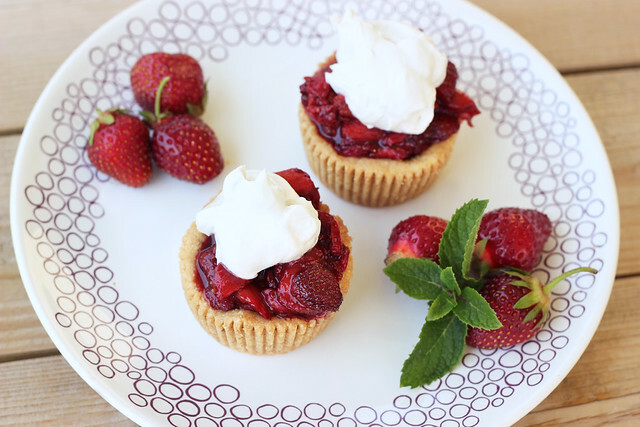 Once they are done baking, you can chill the tart shells while you roast the strawberries, meanwhile you can whip up your coconut cream and when the strawberries are done, you can serve it all up. It can all be done in less than an hour, probably more like 45 minutes and it is so simple, you won’t believe it. If you want to make it even quicker and skip out on the heat from the oven, serve the strawberries fresh. With or without the balsamic vinegar. No matter which way you make it, this recipe will impress the pants off any one at a party, especially those that are gluten intolerant and vegan. They truly won’t believe that it is safe to eat. It is that good. My favorite thing about this recipe is that although it is gluten-free and vegan, no one would never know it. Mark kept eating bite after bite telling me, that this was seriously one of the best things I had ever made. ‘Pastry shop grade’ – he even said. Quite the compliment. Beyond the shells being totally grain-free, and everything being refined sugar-free, it is hard to believe the fluffy, creamy whipped “cream” is dairy free. I honestly need to have a can of full-fat organic coconut milk on hand at all times, so I can always make some whipped “cream”. The other great thing about this recipe is how versatile it is. It can go through the summer with you as different fruits come into season. I cannot wait to make it in the fall with some baked spiced apple slices. YUM! I am happy to once again be posting over at Free People’s blog, BLDG 25 where this week they are celebrating all things ‘Americana’. 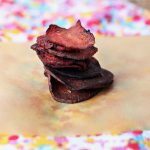 When they asked me to share a recipe that went along with that trend, I kept thinking of all of the wonderful summertime picnics, BBQs and beach trips. I wanted something simple and tasty, but full of beautiful, bright summertime flavors! Although nothing says summertime in America better than ice cream, berry pies and strawberry shortcakes, if you are the gluten-free and/or vegan at the party, that doesn’t always leave much for you. 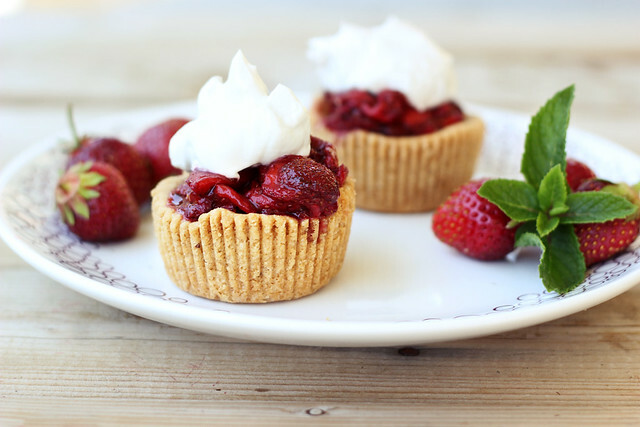 So, I decided to marry the idea of a berry pie with strawberry shortcakes to create these adorable little mini-tarts! This recipe was originally shared on Free People’s Blog, BLDG 25. Preheat oven to 350ºF. 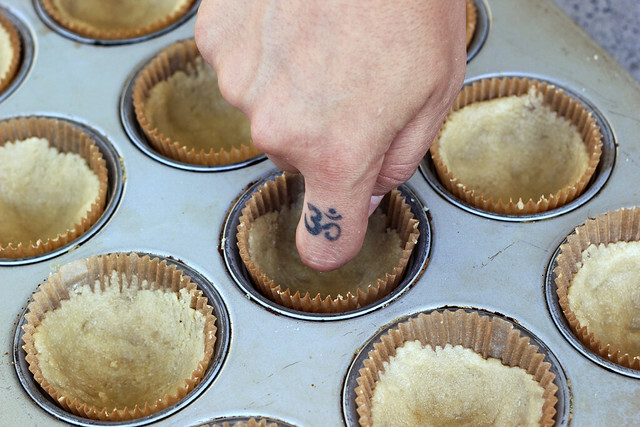 Line 12 cups in a muffin tin with paper liners (you could also use greased mini tart pans). In a large bowl, add all of the crust ingredients and mix very well. Really get your hands in there to get it all together and work it into a nice dough. Add the crust mixture to the muffin cups and press down firmly into the cup using your knuckles, going up the sides a tad bit. Bake for 15-20 minutes until golden brown. Allow to cool in the pan for about 10 minutes, then place the pan in the refrigerator until you are ready to serve. Raise the oven to 400º F. Toss the strawberries with the balsamic vinegar and maple sugar. Allow to sit for a few minutes while your oven preheats. Pour all of the strawberries and their juices onto a parchment paper lined baking sheet or any other overproof dish or pan. Roast for about 10 to 12 minutes until the strawberries are hot but not too overly mushy. You can separate the berries and pour off some of the juices if you want to use it for drizzling, or you can just keep it all together. I kept some of the juice aside to add to some sparkling water for a refreshing drink. Make sure that your cans of coconut milk are well chilled. I recommend leaving item in the fridge overnight. Open the cans of coconut milk carefully, keeping them level. There will be a firm, waxy layer of coconut cream that solidified on top. Carefully scoop this off into a chilled glass bowl. 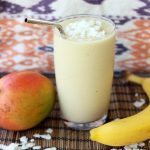 Keep the leftover coconut water, it is great for smoothies. Using a mixer, whip the coconut cream for 3 to 5 minutes until it becomes light and fluffy, with soft peaks. Mix in your maple syrup and vanilla, if you are using. Place the whipped coconut cream back into the fridge until you are ready to use. This may be more than what you need for all 12 tarts, but that’s ok, it keeps for several days, covered in the fridge. yum! those look so delicious! 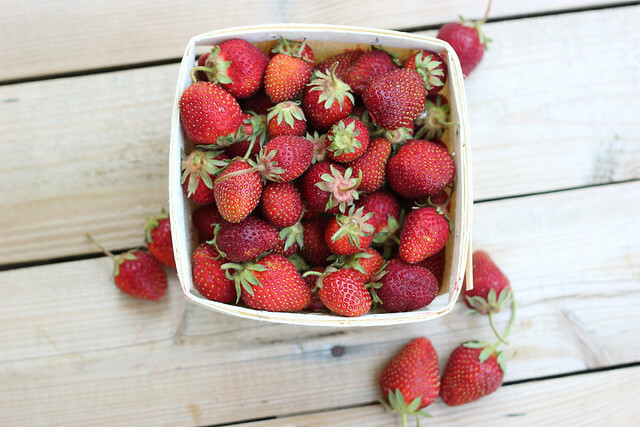 I love strawberries at this time of year:) beautiful little treats! ohmygoodness! I can’t wait to see the recipe 😀 I love love love using coconut cream! Those are gorgeous Beth. Nice work with the mini-tart shells, they look great. love your recipes…and your tattoos! what does the one on your finger mean? is it in arabic?!? Om is the most sacred sound in Hinduism and Buddhism. It is said to be the sound of the universe. Awesome Lou. I hope you enjoyed them! this dough is so delicious…i made it last night for a strawberry tart w/peaches…delish! I have a challenge for you! How can I make the shells without any nut flours? I have a family member that’s anaphylactic for all tree nuts and peanuts! Suggestions welcomed because these look delish! 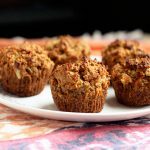 I made these last night using raw sunflower seeds in place of the almond meal and it worked our really well. Just process raw seeds until you get a meal-like consistency. The filling and topping were so tasty! Do you think pecan flour would work for these? They look absolutely incredible but I’m allergic to Almonds. Hmm I am not sure I have never tried pecan flour but I am sure it could work. Hazelnut flour is also another option. For a totally nut-free option, you can try sunflower seed flour, as well. Hope that helps. These are so delicious, thanks for this wonderful recipe. I’ve had to make them four times already this summer. Have you ever used the TJ brand of almond flour for any of your baking? I’m wondering if it’s fine enough. Hi there. I release this post is a little old … but just in case someone is reading it. How much would 2 pints of strawberries be please. Grams or Oz is fine! Also, assuming the 2 pints is before they are chopped? Many thanks.